This is a very simple meat sauce for your pasta or lasagna. It will be richer if you use different types of ground meats. 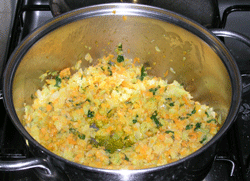 Chop the onion, carrots, celery and parsley finely. In a pan, using medium heat, heat the olive oil and add the chopped ingredients, cooking until softened. 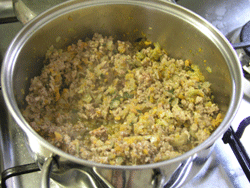 Add the meat, mix everything together and cook over a low flame until the meat changes color. Add the tomote puree (or canned or fresh). Less tomoto lets the meat flavor come through more strongly, while more tomato gives it a blended taste. Simmer gently for half an hour and season with salt and pepper. 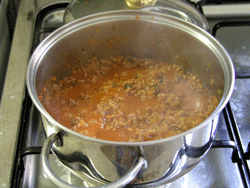 If the mixture is too dry, add a little more olive oil or tomato sauce, never add water because it thins out the taste. Now if you want pasta, cook the pasta in a large pot and cook until al dente. Add the meat sauce, stir and serve. 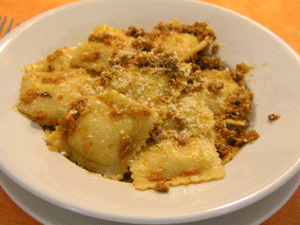 A sprinkling of parmigiano is optional, but really yummy! The sauce is also perfect for lasagna and with polenta. Made some potato tortellini for me, really good!